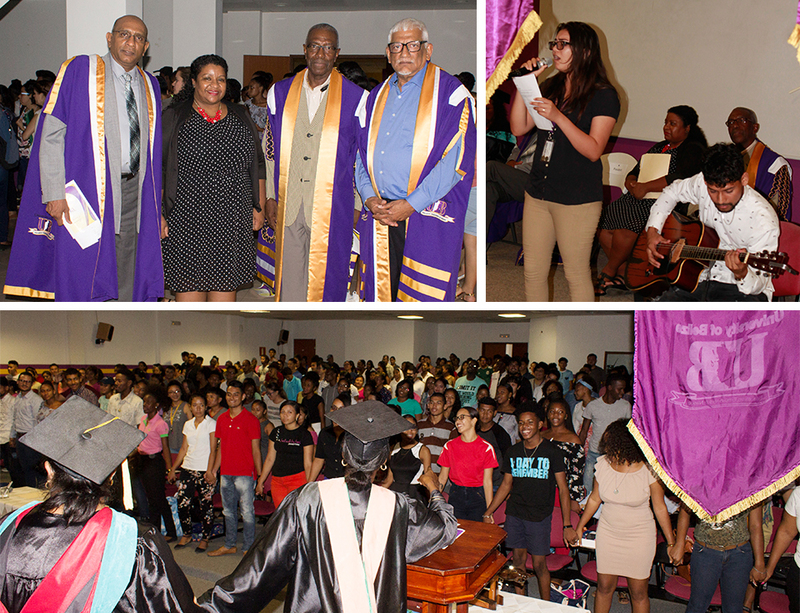 The University of Belize held its matriculation ceremony for the students at its Belmopan Campus on August 22, 2018. The Matriculation Ceremony is to formally welcome the new students to the University and provide them an opportunity to meet the leadership team of the University. The Belmopan Campus was the choice for 748 new students. Professor Emeritus Clement Sankat assured the students that, “everyone at the University is keen to guide and support [them] and provide… all the encouragement that [they] will need to successfully complete [their] studies.” He concluded his message by wishing students his very best wishes for a great and productive year and assures same, they will enjoy their time at UB. Dr. Mariot Simon, Vice President, then led the students in the Matriculation Oath, where subsequently two students from each of the four faculties signed the Matriculation Register. The rest of the students had the opportunity to sign the register after the ceremony. The “singing Dean” as she says she is called, Ms. Leolin Swift-Castillo, Dean of the Faculty of Nursing, Allied Health and Social Work, animated the audience by asking everyone to sing “Lean on me” with her. This year the University welcomed 1, 295 new students, and together with the 3, 812 returning students, it has a record number of 5, 107 students. The Matriculation ceremony for students in Belize City will be held on Wednesday, August 29, 2018 at the Bliss Center for the Performing Arts. Once upon a time, circa 1993, I too entered an arm of UB, then coined UCB Belmopan Junior College, as a wide eyed teenager, hungry for education. At that time, this campus did not exist as you now know it and even the concept of one National University had not yet been discussed. But, one of the main frameworks had been set for tertiary education advancement and improvement in Belize. Fast forward 25 years later, and I am here welcoming you to one of Belmopan’s most colossal features, our University of Belize. Now, I am not sharing this history to illustrate my age nor to tell you that I feel like such an integral part of our University of Belize... I do so in the hopes that you might be inspired to take ownership of our national education plan and allow it to become a part of your DNA, like I have done. I take today’s opportunity to challenge all the stakeholders at UB, so that we might all bring greatness to this University’s name and, by extension, our beloved nation, Belize. And I will start at the very top, with the President. Mr. President, I challenge you today to preside over the affairs of our National University as if it were a new born babe of yours. Nurture it, guide it and mold it into what can only be labelled as excellence. Fashion our university for greatness as our university cry once was “Great UB great!”. As our University moscot, the mighty Black Jaguar strides with majesty in his domain, so too must our University and our students impress and command respect, nationally and internationally. Under your guidance we continue to build our accreditation and reputation. We continue to be a force to be reckoned with. This, Mister President, is what we ask of you. To the Deans, Department Chairs and Lecturers, we ask your most expert skill in providing the highest quality of education to these our young minds. I quote the late but amazing Nelson Mandela, “Education is the most powerful weapon for changing the world. Education is the recipe to eliminating gender inequality, to reducing poverty, to creating a sustainable planet, to preventing needless deaths and illness, and to fostering peace.” Now, I want you to hold that proverbial weapon, the sharp blade of Education, in your mighty hands and utilize it to change Belize, one student at a time. This is no easy task. It takes dedication, time, passion, sacrifice and even prayer but, with you, the brilliant polymaths here, I am certain it is a task that will be taken on and executed smoothly. Now, for you, the students...back in ‘93 we had a quote in my classroom pasted above the then whiteboard. It said “the onus is on you”...it is your job to collect what you will of the knowledge that shall be spilled here during your years with UB. If you are wise, you will grab all you can carry and come back for more. I refer to a favorite writer of mine, who says “the teacher who walks in the shadow of the temple, among his followers, gives not of his wisdom but rather of his faith and his lovingness. Because no man can reveal to you that which already lies half asleep in the dawning of the knowledge.” In essence, Khalil Gibran is advising you that you need to activate the knowledge that is already embedded in your being. No one will hold your hand here. No one will babysit you either. University life is preparation for survival and success in the adult world. Prove your worth. Ignore distractions. Focus and succeed. Everyone has the potential to excel. Everyone has the ability to empower this nation. Being here among the 5,107 students enrolled in our great University of Belize gives you an advantage over many others. Make much of the opportunity. Congratulations on being here and have a lovely university experience which will grind you, stretch you and shape you into the experts that we need for a better Belize. Long live UB. The University of Belize mourns the passing of the great Caribbean author, novelist, essayist, widely critiqued and criticized, controversial and Nobel Prize winning writer from Trinidad, Sir Vidiadhar Surajprasad (V.S.) Naipaul. At the university and throughout the secondary and tertiary institutions of Belize, generations of children and adults can say that they have had the pleasure of reading and connecting their own circumstances and observations of Belize with Naipaul’s Miguel Street, a comical collection of short stories that satirizes a community of people who live along that street. Over the past years, students and faculty of FEA have also had the opportunity to critically analyze and be fascinated by several of Naipaul’s spectacular works, including The Mystic Masseur, House for Mr. Biswas, The Middle Passage, The Mimic Men, An Area of Darkness, Magic Seeds among others. As a matter of fact, it was just a little over a year ago, in UB’s own Dr. Christopher DeShield’s upper level creative non-fiction writing course, Reading for Writers, where he introduced his students to Naipaul’s essay, “The Ultimate Colony,” based on his visit to Belize, then British Honduras. As DeShield aptly states in the introduction to the debut edition of UB’s own literary journal, Dobl Benk: A Belizean Journal of Creative Non-Fiction and Poetry, this work, though “it presents a rather unflattering national portrait … it presents a valuable literary snapshot of colonial Belize” (x). DeShield’s observation succinctly captures the daring, controversial, at times obnoxious, yet truth telling portraits Naipaul expressed about formerly colonized nations. A step further in this same journal, guest contributor, Courtney Gillett, published a poem, “Ultimate Colony: A Poem for the Interior,” which is “the first significant Belizean literary response to Naipaul’s essay” (DeShield, x). Naipaul joins the recently deceased stars of the Caribbean imagination, Guyanese author, Sir Wilson Harris and, Saint Lucian and fellow Nobel Prize winning author, Derek Walcott, in what may be defined as a heavenly Caribbean, labyrinthine palace.